Survey: What cancer terminologies do you prefer? 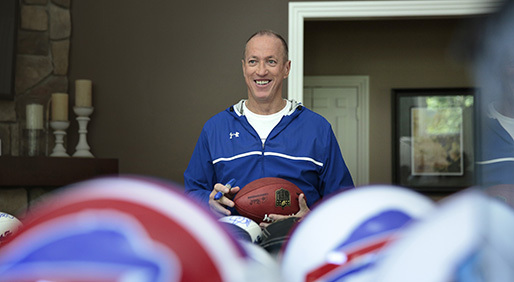 In a dark, empty office building a few yards from his foundation’s headquarters, Hall of Fame quarterback Jim Kelly scrambles to make sure he’s wearing his wedding ring. He won’t do an interview without it. Of all the labels that have been applied to the remarkable Buffalo Bills all-time leading passer over the years, the one that fits him best seems to be “family man.” In an hour-long meeting that was intended to focus on his own cancer journey, Kelly kept turning the conversation to his brothers, and his wife and his two daughters. “For me, I know that all the things I’ve been through – good and bad – I’ve always had a very good team around me, whether it’s been in sports or in life. In the game of life, it’s been my five brothers, my mother and father, and, of course, my wife and two kids,” Kelly said. Kelly is hardly the only person to have played professional football, and there have certainly been other cancer patients. He’ll be the first one to tell you, though, that nobody has a story quite like his. Fans of his sport watched the quarterback’s transformations from afar, as he evolved from a college football Heisman Trophy contender in 1982 to a father who would eventually lose his son to a rare disease in 1997, to a Pro Football Hall of Fame Inductee in 2002, and then to a patient of squamous cell carcinoma in 2013 and again in 2014. Kelly retired from professional football at the end of the 1996 NFL season. While a sense of sadness at the thought of no longer competing in the game that he loved could have consumed him, it didn’t even have the chance. Two weeks after his announcement, he learned that he would have a son, a boy he and his wife Jill would name Hunter. Hunter would pass away at the age of 7 from a rare genetic disease called Krabbe leukodystrophy, in which mutations in the GALC gene result in progressive damage to the nervous system. Kelly would respond by founding Hunter’s Hope, a non-profit organization committed to raising awareness, research, and family care for people with Krabbe and other leukodystrophies. In 2013, Kelly was diagnosed with squamous cell carcinoma. It took a complete removal of his upper jaw before he was declared cancer-free. Even after that, his hardest days were still ahead of him: The cancer recurred a year later, and he had to prepare himself for chemotherapy. Now, Kelly is the keynote speaker at the Chemotherapy Foundation Symposium (CFS) Innovative Cancer Therapy for Tomorrow Conference – run by Physicians’ Education Resource, a sister company to CURE. There he will share the steps from his speech titled “A Journey of Perseverance,” and oncologists in attendance can rest assured that they’ll hear all about the people who accompanied him along the way: his five brothers, his wife and his two daughters. In his conversation with CURE, Kelly stressed the importance of his family and the way that those close to him approached his two battles with cancer. When Jim Kelly, who ranks 25th all-time in passing yards (35,467) and 27th all-time in passing touchdowns (237), comes up in conversation, it could be assumed that any references to his “team” would lead to discussions about offensive linemen, running backs and wide receivers. To Kelly, though, his team is much more than just the men in cleats who stood beside him on the gridiron. The team he talks about most consists of his family, nurses, oncologists, and yes – even some names familiar to the common football enthusiast. Now 57, he draws strength from his “Four F’s” – Faith, Family, Friends, and Fans. A cancer diagnosis can be daunting. The repercussions of it and thoughts of “what comes next” can consume the mind. Kelly remembers feeling particularly troubled once he realized that he was going to have to tell his family – his teammates – of his new normal. Never, though, according to Kelly, did any of them say that they felt burdened. Shortly after his diagnosis, his wife, Jill, requested that they go public. At first, he disagreed, dreading the prospect of members of the media and football fanatics getting involved in his personal life. Eventually, he conceded to his partner’s wish. Ultimately, he agreed and told the world about his cancer. What followed was an outpouring of support and well-wishes. Kelly recalls hospital visits from his closest friends on the Bills teams that won four straight American Football Conference (AFC) Championships, including fellow Hall of Famers running back Thurman Thomas and defensive end Bruce Smith. The two would compete to see who could give their captain a bigger, better puzzle, and then sit alongside his hospital bed to complete it with him. Every day he’d receive “get well” cards from fans of rival teams, including those of the Dallas Cowboys and Miami Dolphins. In his football career, Kelly was the victor of many highs and the victim of many lows. He was recruited to play football by Penn State University, his favorite team in childhood. Soon after, Head Coach Joe Paterno asked him to play linebacker instead of his preferred position of quarterback. So he decided to accept a scholarship to the University of Miami, where he played well enough to become a leading candidate for the Heisman Trophy, the collegiate level’s greatest individual honor. During his senior campaign, he blew out his shoulder. Many thought his career was over. In the 1983 NFL Draft, Kelly was projected as a first-round pick; he was selected 14th overall by the Buffalo Bills, a team he didn’t want to play for in a city he didn’t want to live in. With the Bills in the early 1990s, Kelly led his team to four consecutive Super Bowls; he lost them all. To say that Jim Kelly’s career has been riddled with disappointment would seem like a slight to the average person; one who has never stepped under center at the Super Bowl even once, let alone in four consecutive seasons. His life, though, has been a constant overpowering of obstacles. It has been filled with trials and tribulations – some pertaining to football, and others not, but each faced with an consistent air of optimism and a determination to conquer it. Those peaks and valleys, though, helped prepare Kelly for what was to come in his post-playing days – his second life. For somebody who isn’t a cancer patient, it can be difficult to understand the impact of simple words. It was easy, however, when it came time for one of the members of Kelly’s team to decide whether to share a piece of information he had been given from the lead oncologist. “Nothing scares me anymore. If the good Lord decides tomorrow is my day, there’s one guy that’s going out fighting, but I’m going out with a smile on my face, because I’ve lived a life that certain people would love to have,” Kelly said.